I feel so much love from Pink Olive. 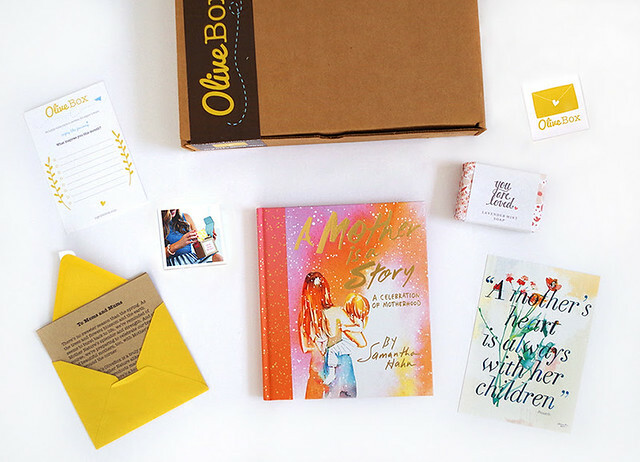 Not only did they host a lovely meet + greet for A Mother is a Story, they also included it in their latest Olive Box. In case you don’t already know, OliveBox is a monthly subscription service for paper lovers. Every month, members receive a delightful box of paper & lifestyle products delivered to their front door. When customers sign up for OliveBox, they will not only be giving this gift to themselves, but they will be receiving something they can gift forward. The idea behind OliveBox was born out of love for creative finds by Grace Kang, former buyer of Bloomingdale’s and Barneys and founder of popular Pink Olive gift boutique in NYC. In A Mother Is A Story (published by Abrams), artist and author Samantha Hahn’s lush watercolor illustrations pair perfectly with hand-lettered quotes about the joys, challenges, and blessings of motherhood. The wise and whimsical tome makes a perfect present for mom, intended to be treasured for years.